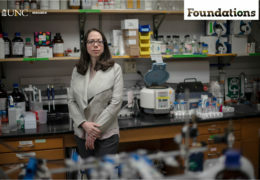 Virginie Papadopoulou specializes in using ultrasound technology to study the body in extreme environments, ranging from the physiology of scuba divers to the blood flow in cancerous tumors. Her weapon of choice? Tiny bubbles. 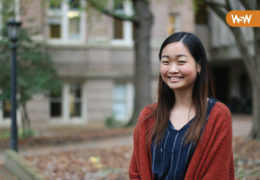 Hannah Kim is a junior double-majoring in psychology and economics, with a minor in social and economic justice, within the UNC College of Arts & Sciences. Her research focuses on determining the differences in the prevalence of psychological disorders among different demographics. 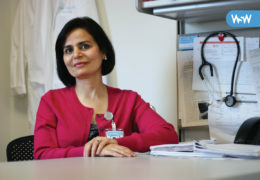 Priya Kumar is a professor of anesthesiology in the clinical division of Cardiothoracic Anesthesiology within the UNC School of Medicine. 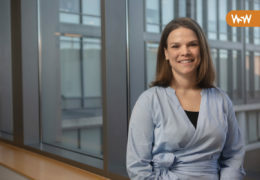 Her research focuses on exploring interventions to protect the heart against surgical stress — specifically whether blood pressure management and bleeding reduction can prevent heart complications during non-cardiac surgery. Margaret Dillon is an associate professor and director of cochlear implant clinical research in the Department of Otolaryngology/Head & Neck Surgery within the UNC School of Medicine. Her research focuses on optimizing how cochlear implants distribute and present speech information and the new patient populations who may benefit from this hearing technology. 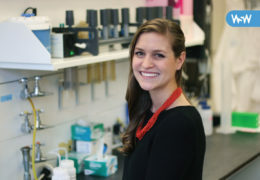 Alyssa Grube is a PhD student in the Department of Environmental Sciences & Engineering within the UNC Gillings School of Global Public Health. 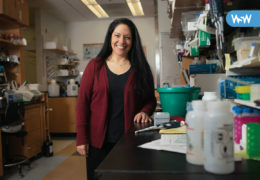 Her research focuses on detecting antibiotic-resistant genes in the Galápagos Islands to better understand the effects of human-caused pollution on bacterial communities. Keyaira Crudup is a junior majoring in biomedical and health sciences engineering within the UNC/NC State Joint Department of Biomedical Engineering. 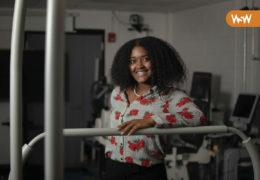 Her research focuses on improving the walking speed of aging individuals by training them to increase the amount of force they use to push themselves forward. Ashley Ward is the climate integration and outreach associate for the National Oceanic and Atmospheric Administration’s Regional Integrated Sciences and Assessments program, based out of the Department of Geography within the UNC College of Arts & Sciences. Her research focuses on identifying and increasing awareness of the health impacts from extreme climate events in the Carolinas. 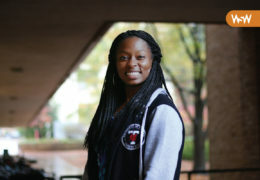 Kira Griffith is a sophomore majoring in neuroscience within the UNC College of Arts & Sciences. 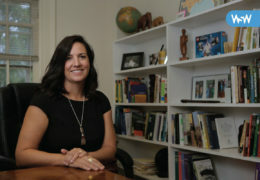 Her research focuses on understanding the effects of music on the brain. Specifically, she strives to learn why music therapy seems to benefit so many people of all ages and with varying sets of neurological conditions. 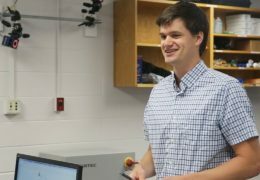 Jackson Richards learns how to build a successful research project and implement skills acquired in the classroom.